While traveling in Portugal this summer, I used a lot of services such as Airbnb, Über, Lonely Planet, Tripadvisor, Foursquare and Happy Cow to get around, plan what to do, where to eat, and to book accommodation. Digital services such as the ones I mentioned have truly put the customer/user in power. These services have also raised the bar for the type of service customers expect from other industries. In some cases, however, companies benchmark the services they provide against Über and others for the wrong reasons. Uber, Airbnb, and others utilize technology to make their processes swift and easy to use. That works as long as the service is simple and everything works as planned. But when more complex scenarios arise, technology can’t (yet) beat a human being. A lot of companies focus their digitalization on self-services, which is great. But quite often customers only prefer self-service, because the task at hand is so simple and easy that it’s faster and easier to do it yourself – especially an interaction with unskilled or unmotivated customer-facing employees can feel useless. So, creating better digital experiences for self-services is only one side of the coin. The other is how you can enable yourself as an owner or your employees to provide better experiences for your customers, while they are interacting with you. Many companies, unfortunately, neglect the latter. Even so, you can often implement that faster and cheaper. As companies tend to benchmark themselves against high-tech digital service providers, there is a tendency that the expectation from creating digital services is to lower operational costs or increase automation. These are undoubtedly byproducts of going digital, but they should not be the drivers of your digital development agenda. The driver for going digital is to be fully transparent (with your customers) and ensuring you create more value for your customers through digitalization. Just recently I asked a certain electronics store a specific question over their customer chat. The customer agent (or bot) only answered my question about the warranty of the product, when he (or it) had the possibility of telling me which other products they sell have a longer warranty thus helping me decide what to buy. I had an amazing customer experience in Carrapateira, Portugal with a very low tech solution. 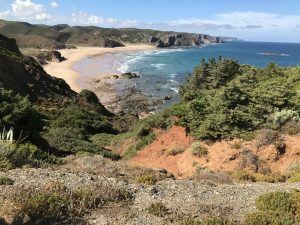 I like to hike while traveling and decided to do parts of the Rota Vicentina while in Portugal. While driving towards Carrapateira, we booked accommodation in a lovely place called Pensão das Dunas. When we arrived in Carrapateira, Eduardo the owner of Pensão das Dunas greeted us with a lovely smile. We then found out that our booking wasn’t confirmed as some other user had been a tad bit faster with their booking. Carrapateira is a very small town and we thought that we were in trouble with finding a place to stay for a few nights. It was getting late and we were not in the mood to spend hours on finding another place to stay. But as it turned out, we weren’t in trouble at all. Eduardo and the others in the same network had created a pretty amazing digital solution with a very pragmatic approach. After Eduardo told us that his place was fully booked, he told us “not to worry”. He jumped to his computer and switched to a browser with about 20 open tabs in it. Apparently, his collaboration network had agreed to manually create and update their accommodation availability in Google Calendar. With one view, Eduardo could see what options were possible for the next few nights. He then took his mobile, made a few calls to confirm that a few places were free and cleaned. He went into Google Drive to show us pictures of the possible options. For us, a decent shower and bed were important and from the pictures, we could see around if the options were OK.
After this, he opened his Google Maps tab to show us how to drive to the place we chose. By using “Google Street View”, he showed us where to park, where to turn in the small streets and so on to make it easy for us to find the accommodation. He showed us everything else that we needed to know. Eduardo continued by showing us how to get to the grocery store and where to find restaurants that were vegan-friendly (along with the menus of these places), the starting points for the hikes around Carrapateira, how long the hikes are and what we should take into account in each hike. Finally, he told us that we’ll have to pay the accommodation in cash to the owner. Eduardo also showed us an ATM if we didn’t have enough cash with us. All of the information and options were ready on Eduardo’s tabs, all in a fully digital format. I was amazed by how swiftly and easily we found a new place thanks to how people in Carrapateira had agreed to collaborate digitally with each other. Even though there was a lot of manual work with opening pictures, showing how to get from point A to point B and so on, the service we received was spot on. Eduardo answered all of our questions with showing how things in reality were. We knew where to go, what to expect and what our options were for eating, hiking and for other activities. It was the combination of “tech” and human touch that made the experience exceptional. The solution that Eduardo’s network had created wasn’t the most high-tech, but it was very pragmatical and did the job. All the information needed was in a digital format and easily accessible for anyone in the network. So was the solution that the people in Carrapateira had developed fancy? Maybe not, but it for sure was efficient, fast to implement and most importantly, enabled Eduardo to solve our problem. Of course, the network in Carrapateira could have developed a better booking system that wouldn’t have misled us into believing that there were free rooms available in Pensão das Dunas. However, adding the human touch made the experience more special for us. The question for your organization is how much of you’re the customer journey do you really need to digitize? What digital experiences can WOW your customer, but also where can you keep the human touch to WOW your customer. Going digital does not mean that there is no room for human interaction, nor that every step of a process should be automated. Digitalization essentially means that information is easily reachable, digital and that the quality of the information is high. How that information is used, presented or automated is where your digital roadmap, the amount of potential users/customers and most importantly what customer problem you are solving drives the solution you should incrementally build. You don’t always have to aim to be the next high-tech digital solution. Often a lower level of automation and a human touch achieve the same or better WOW effect for your customers. If you’re traveling in Portugal, you should definitely check out the small town of Carrapateira and the Rota Vicentina. A lovely town and an amazing hiking destination.